Sometimes several different things come together at just the right time and ends up with a new, unique element in our display. Such was the case with our North Poles, which were added to the display for the 2011 season. yard, and the city had piled over 4 feet of snow from the street across our entire frontage. Needless to say, much of our display, including virtually all of our arch fence, which was less than 3′ high at the very tops of the arches, was all but lost to viewers out on the street. The previous couple of years weren’t nearly as bad, but still had snows that cause the arches to be at least partially obscured. It was clear something needed to be changed. The second factor was that a few friends Tim knows through the online decorating community had come up with a concept called a “North Pole”. 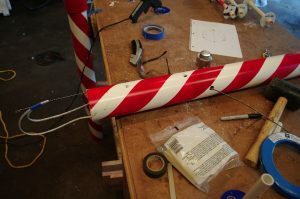 Basically it was a PVC pipe painted with a candy-cane stripe, a low-wattage light bulb on top, and a white globe over the bulb to make it look nice. 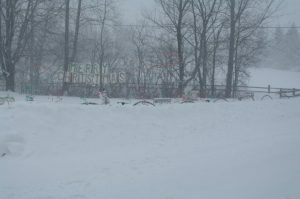 Tim realized that perhaps these could be placed between all of our arches to not only enhance the look of the front of the display, but actually be used to raise up the arches over any potential snow. foot tall and completely open at the top, is not at all practical for our snowy Minnesota climate. But what these elements did have was relatively cheap RGB strips inside (meaning they can be set to virtually any color), one relatively cheap DMX module per star (meaning each individual star can be individually controlled via the DMX lighting protocol and the sequencing software we use to control the whole display), and a method for chaining them all together and mixing both the power and signal across a simple Ethernet cable. became a marriage of these three ideas/needs. We took the basic North Pole, replaced the incandescent light bulb with the RGB LED modules and DMX controller as in the CoroStars, and added the capability for it to support our arch fence. By default, the bottom of the arches are raised up about 8 inches above ground level (whereas they used to be right at ground level). If deeper snow has fallen or is anticipated, we can relatively easily raise the arches to about double that height off the ground, which puts the top of the arches just a bit taller than the tops of the North Poles themselves. 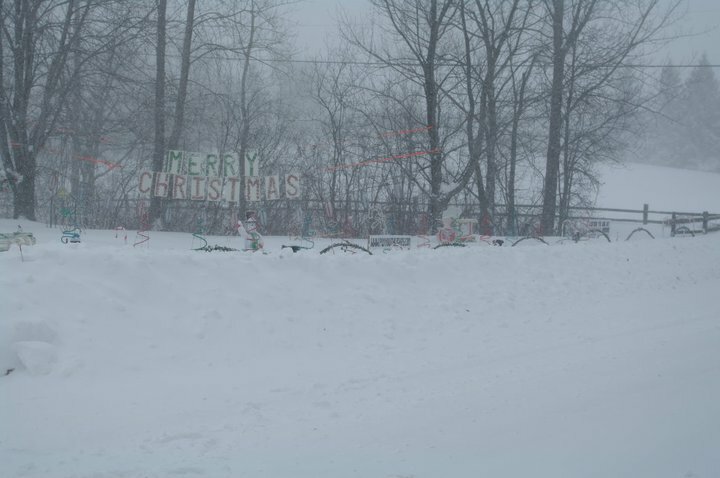 Hopefully we won’t need to use that feature, but if so, it will be a lot better than losing the entire fence behind a wall of snow once again. 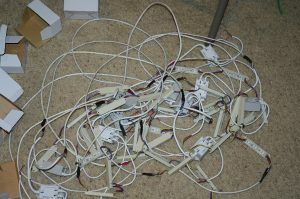 This rat’s nest is the pile of electronics for the 14 North Poles. all soldered up and ready to be installed in the poles. This is the electronics for one pole. 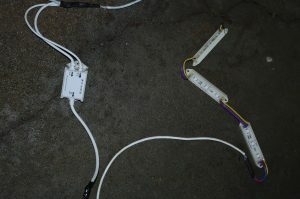 To the right are three “5050” RGB modules connected to a small DMX LED controller on the left. Here the electronics are being installed into the North Pole itself. I evidently didn’t take pictures of creating the poles themselves. 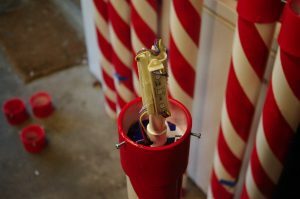 They are 3″ PVC water pipe, which was cleaned, masked, and sprayed red for the stripe. Holes were drilled for the arch support poles as well as the electronics, which we see here being fished in place. Here the top of the North Pole is being assembled. a 3″ PVC union fitting, with screw holes drilled/tapped to hold on the globe which will eventually sit on top, sits on top the PVC pole. 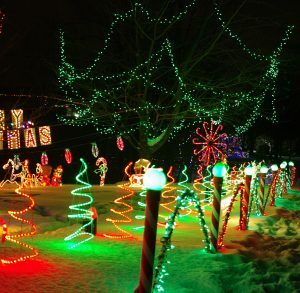 1/2″ PVC water pipe is used to support the LED’s, which are still hanging off to the side in this picture. 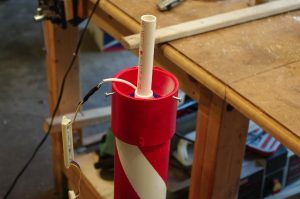 Here the LED’s have been glued in place to the 1/2″ water pipe. 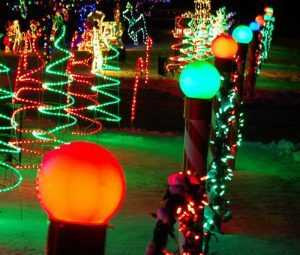 Through experimentation, we found that angling them slightly, plus orienting them more toward the front and sides than to the back (which nobody typically sees but us) helps give the lights the best spread across the acrylic white globe which goes over the top. This picture shows how the arch holders work. Holes are drilled through the PVC North Poles at an angle, where the rods we use to support the arches can be slid into and lock into place (here the arch has been lifted up to show the rod and the hole). Note the additional hole above, which we can use if we want to raise the arches up over snow. 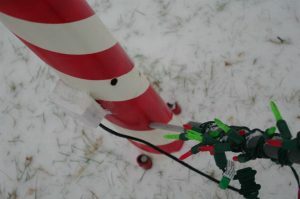 This is what the back of the noth pole looks like (the side you don’t see from the street). The arches are in the “low” position here. The white box is the Cat-5 jacks that feed power and DMX signal into the pole. 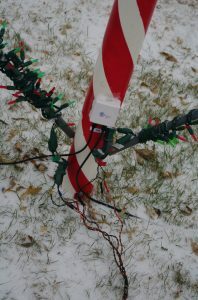 The two wires go to the neighboring poles. 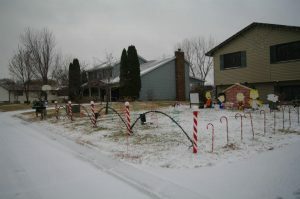 Here’s the 5-pole, 4-arch run directly in front of the house during the daytime. You can see the 9-pole, 8-arch run elsewhere on this page. 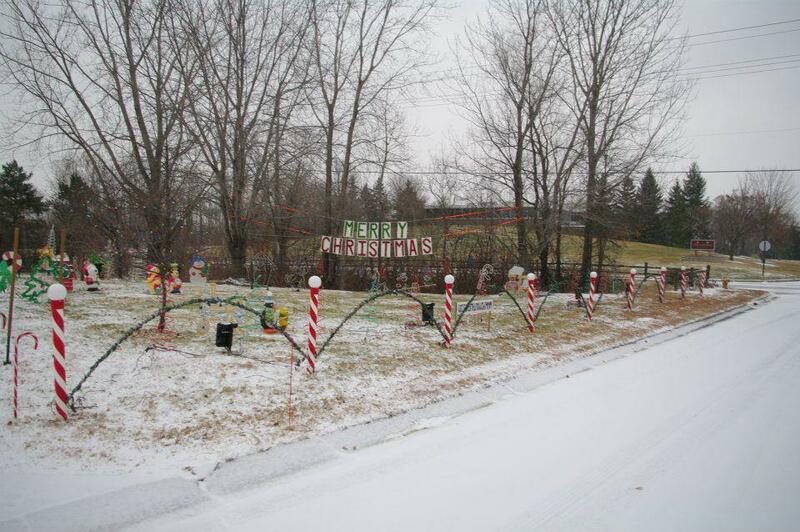 Here’s a picture of the pole line from the 2013 season, in an “all green” configuration. Each pole can be any color, individually from the others.